When researching new furnace cost, its important to understand the process and vocabulary associated with furnace replacements. Use our furnace installation guide to help you understand what you need to consider when choosing a new heating system, including tax credits, financing, and the vocabulary required. As a Trane® dealer, we have years of experience installing all furnace and air conditioner makes and models. There are usually 6 different furnace options, which vary in degree of energy efficiency levels they offer. Your choices are usually grouped into 2 categories: 80% AFUE or 90% Plus AFUE. AFUE, or Annual Fuel Utilization Efficient, refers to how efficiently a furnace converts fuel to energy and is the standard by which U.S furnaces are rated. The basic ratio is that, if you have an 80% AFUE furnace, 80% of your energy bill goes to heating your home and 20% is wasted fuel. It is important to note that furnaces that are 7-15 years or older can have a lower AFUE rating, meaning that they waste even more energy in the home. The PLUS in the '90% Plus AFUE' rating refers to the fact that a furnace converts 90% OR MORE into heating. While, this percentage depends on the make, model and brand of furnace you purchase, a 90% Plus AFUE is recommended to those who are concerned with high energy bills. Some manufacturers even offer furnaces with higher efficiencies than others. Due to the intense winter weather of the Chicagoland area, we usually do not recommend 80% AFUE furnaces for residents who are planning to stay in their home for 5 years or more. It may seem financially sound to purchase the most cost-efficient furnace, but what you save in installation will cost you in heating your home. These options indicate the ways in which a furnace heats the home. Single Stage furnaces are designed to heat your home and keep you warm during the coldest weather in your climate. Therefore, when they are operating, they are heating at their full capacity. Unlike those furnaces, Two-Stage furnaces are designed to operate like two separate furnaces, maintaining more consistent comfort levels throughout the home. Variable Speed furnaces deal specifically with the indoor air blower motor, a part that determined the amount of air the blower is required to deliver to your home. Items that can restrict airflow can include ductwork design, the location of your furnace, the zoning of your thermostat system, and a dirty filter. Variable speed furnaces allows you to bypass these airflow restrictions by allowing your home to receive the amount of air required to keep your family comfortable. Variable Speed furnace motors have intelligent technology that monitors the blower and adjusts airflow in your home accordingly. The Variable Speed and Two-Stage 90% Plus furnaces come with the option of a second pipe. The second pipe allows the furnace to draw combustion air from outside of the home. This benefit reduces the “draftiness” of your home during the winter months. This is because in traditional One-Pipe systems, the furnace pulls from indoor air to heat. Your home naturally wants to replace all the air it has blown out, which is does by pulling in air from windows, doors, cracks, and other exits. With a Two-Pipe system, you are bringing in air through one pipe, using it immediately, and sending it out of the exhaust pipe. This means your home stays warmer longer and results in a decrease in your heating spending. The first step our installation team takes is to introduce themselves politely to those in the home. They will also ask for your preference between booties and shoe removal when working within your home. Once the introductions are complete, they will review the quotation and the installation process with you, addressing any final concerns or questions before the work is started. This is done to ensure that everyone is on the same page and that you are 100% aware of the expert service you are receiving. When the installation is complete, they will review a checklist to make sure everything is complete and fine tuned to manufacturers specifications. Finally, they will run your system for the first time, walking you through the specifics of your new furnace unit. 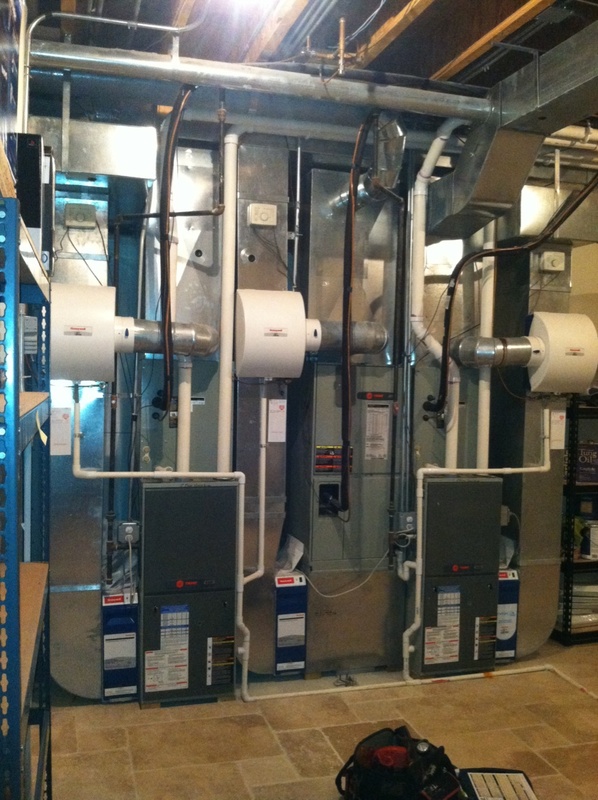 As an expert Trane dealer, Mr. Duct has you covered when it comes to new gas furnace replacements. We have home comfort system products that address all physical limitations of the home, including various stages, upflow requirements, and sizing.